Megastar Chiranjeevi's younger daughter, Srija, on Monday lodged a complaint with the Central Crime Station women police in Hyderabad against her husband, Sirish Bhardwaj, alleging that she was ill-treated physically and abused by her husband and mother-in-law. They had eloped and married in October 2007 without the consent of Chiranjeevi`s family. 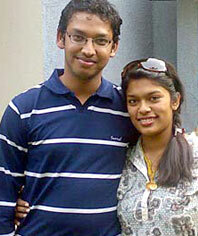 Srija was 19 then and Sirish, 22. Commissioner of police, A.K. Khan, said, "We have received the complaint lodged by her and we have registered a case under the Dowry Harassment and Dowry Prohibition Act." The police said that Sirija alleged that her husband and mother-in-law have been harassing her and had physically assaulted her. She had recently re-registered all properties that were in her name back to her parents` name. "She has alleged that this re-registering of properties in the name of her parents irked Sirish Bhardwaj and he started harassing her more," said a senior police official. In her complaint Srija alleged, "He started harassing me after an year of marriage. As I had married against my parents` wishes and for my daughter`s sake, I remained silent. As Sirish is always expecting money from me I felt insecure and transferred all my properties to my parents. Later, the harassment increased and they kept a watch on my movements. I tolerated all this. "Recently during my cousin Allu Arujn`s marriage, they called me several times to know my whereabouts. A week back he asked me to get Rs 50 lakh and after that I came home and didn`t go back. My mother-in-law was a part of all this." Bhardwaj is currently a member of Central Board of Film Certification Regional Office.